An expert solution to backup or archive OST file mailbox data into multiple email messages in EML format. Save individual emails with attachments in a .eml file. All email meta data like to, cc, date, time, the subject line is retained during transfer. Move data from an Outlook offline storage to another computer across platforms using this tool. Migrate OST emails, contacts, tasks, calendars to EML file. 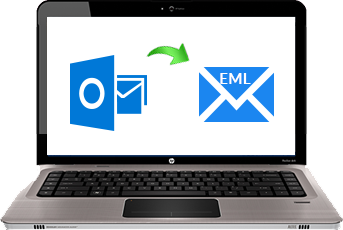 Use the OST files to EML Converter to migrate offline mailbox data to multiple individual .eml files. Convert emails with attachments, contacts, tasks and calendar items to EML file format. All the mailbox items are available to preview before starting with the conversion. There are two types of view available: Normal view and With Attachments view. 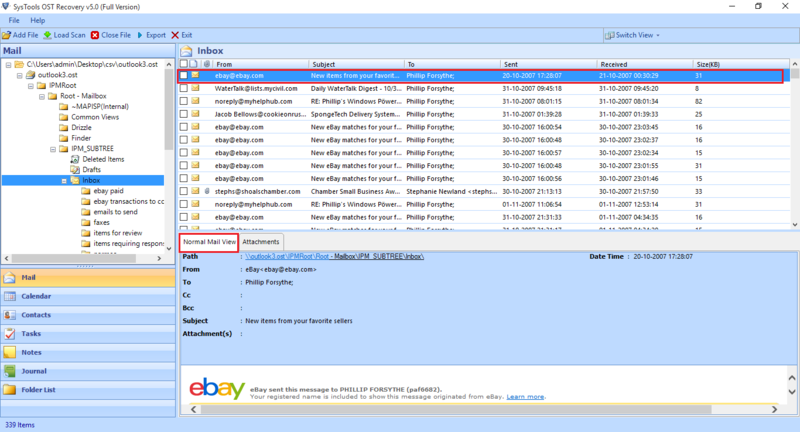 The OST emails into EML Conversion tool can repair and recover data from a damaged or virus infected Outlook .ost file. It can retrieve data even from a highly corrupted file. As soon as the OST file is uploaded into the tool, it starts to scan and repair any corruption within it. Any lost or recently deleted data is recovered in this course. Select between mailbox items like emails, contacts, calendars to save time and prevent needless migration. The software also allows its users to specify the email folders that need to be exported. This further simplifies mailbox for conversion. Choose between Inbox, Drafts, Sent Items, Trash etc. Discard the folders that need not be migrated. Export emails from OST File to EML maintains data integrity and folder hierarchy of emails during transfer. There is no data loss during migration. Each email file is found in the exact same folder as they were in the original mailbox. The mailbox data is safe and secure. It is not shared with any third party or used by the application in any way. The tool has a facility to apply a date range to the received date on emails. This will export limited data and save emails as EML file. Use the tool to archive Outlook offline storage of mailbox data on the local machine. Create multiple individual .eml files that can be used by multiple email clients like Outlook Express, Windows Mail etc. Save the offline data within the Outlook .ost storage file in an image. Re-use that image for the next time. The Outlook EML Converter tool provides an option to load a saved scan file. Also, one can give different names to their output file using the Naming Convention option. There is no change to email meta data including to, cc, sent date, received date etc. The email application is not essential for migrating mailbox data from offline storage file to individual message files. 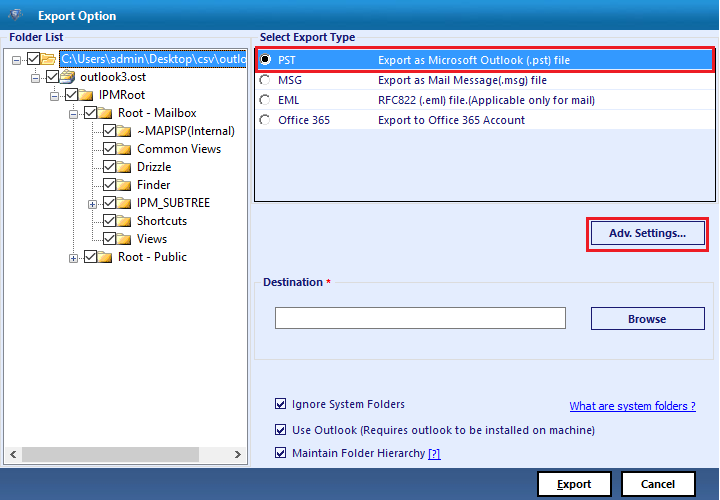 MS Outlook is not essential for performing OST emails to EML Conversion. The software interface is user-friendly and easy-to-use. It has a Windows Explorer-like view. The view can be rotated between Horizontal and Vertical views. 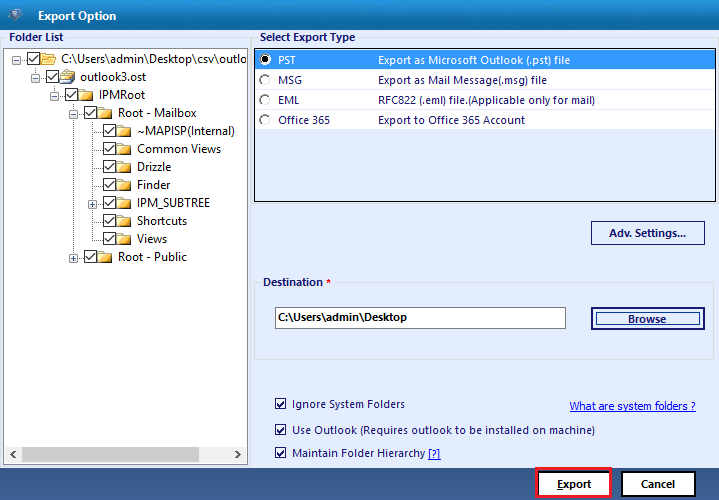 Export emails from OST File to EML displays a complete report of the conversion after it has been completed. The report contains detailed information regarding the name of the OST file, success count and failure count. This file can be used as a reference in future to get the details of the migration process. Verify the successful completion of the task by checking this file. This is an amazing product. I have tried the free version to move my emails from Outlook OST to EML format. I was able to do that successfully without fail. I will be recommending this tool to more of my friends and colleagues at my workplace. Want to take this opportunity to thank the development team for coming up with such a great tool. Kudos! I had many emails in my MS Outlook account. I was looking for a solution to move my offline storage of data into individual message files. I was able to do that easily using the OST EML Export tool. It is very simple yet effective tool that solved my problem with simple steps. I did not have to fumble much to try converting again as a scan data was already saved in the tool. Thanx! MS Outlook is an emailing application and a personal information manager introduced by Microsoft. It is used to create emails, contacts, tasks, notes, journal, calendars etc along with send and receive emails. It uses IMAP and POP3 accounts to create mailboxes. Many accounts are also created on the Microsoft Exchange server. These accounts have an offline storage of mailbox data saved on the users’ machine. This database file is called the Offline Storage Table or the OST. It saves mailbox data in a .ost file and can be accessed using only the Outlook email client. To backup the offline storage of data on a drive on the same computer or another, the file needs to be saved in an EML format. Where can the OST EML Export tool can be useful? Backup Outlook offline data to the users’ PC. Take email files to Windows, Mac or Linux systems. How Outlook .ost to .eml Converter can be useful in such cases? Save offline storage data in individual .eml message files. Archive Outlook mailbox data in multiple EML file formats. Transfer OST file to a new computer using the .eml files. Recover and Repair a corrupted offline data file before move. Extract lost and recently deleted emails during scanning. Retrieve emails from infected or password encrypted files. 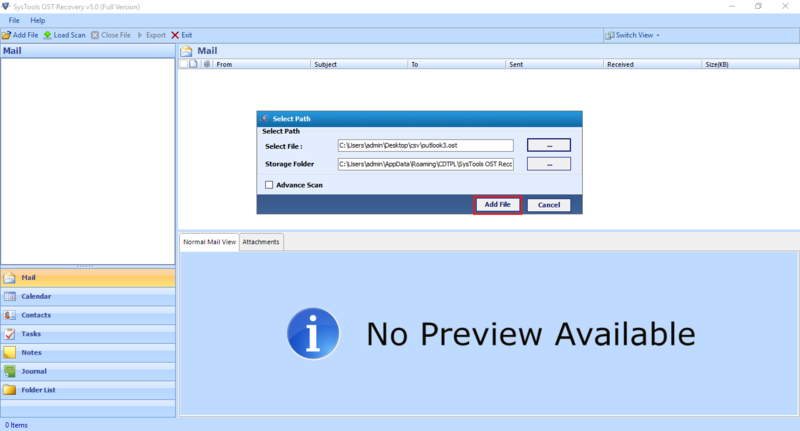 All this can be achieved using the Outlook EML Converter that can carefully extract emails from an OST file. The individual messages are saved in an EML file format with attachments. There is no data integrity of emails affected due to the conversion. The tool repairs any corruption within the Outlook data file and converts it to Outlook Express compatible .eml file.